While you’re in Bend, be sure to explore this beautiful crater located at the Newberry National Volcanic Monument. Newberry Crater is located about 35 miles from Bend. Fish for trout and salmon in the two lakes. Enjoy horseback riding, hiking, and camping when you visit the crater. The steep rims of the crater vary in size, ranging from 700 feet to over 1,700 feet. Several miles south of Bend is the spectacular Newberry Crater. It covers nearly 17 square miles of the vast 500-square-mile Newberry Volcano. Although technically a caldera, Newberry Crater Oregon is believed to have formed nearly half a million years ago. The scenic crater has two alpine lakes, a variety of cinder cones, and many fascinating and unique obsidian domes and lava flows. Nestled in the heart of the Deschutes National Forest, most of the crater is heavily forested. Located about 35 miles from Bend, you can reach the crater by taking Highway 97 south and then turning on Paulina Lake Road. Camping – The caldera has several beautiful places to camp, including two group areas. 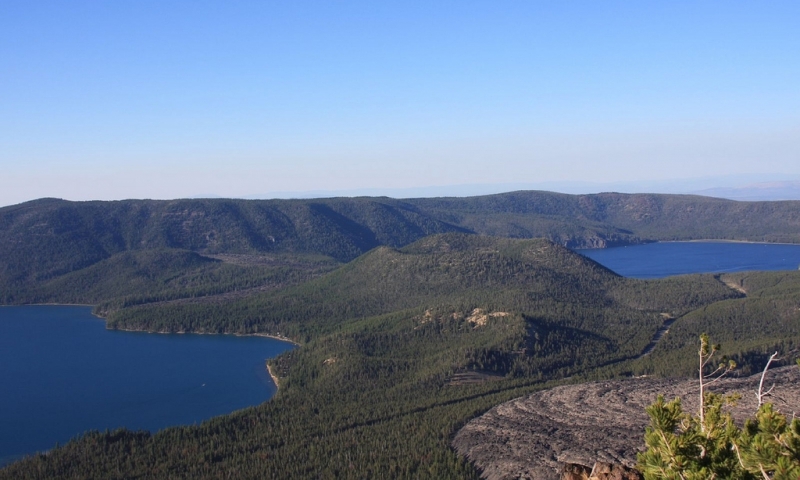 Hiking – Hikers will enjoy the Newberry Crater Trail, which goes across the caldera’s floor. There are several other hiking trails in the park. Horseback Riding – There is a horse camp not far from East Lake that has a corral with each campsite. A variety of horse trails can be accessed from the camp. Fishing – The two lakes in the caldera provide anglers with plenty of trout and salmon. Winter recreation – With approximately 35 inches of annual snowfall, the crater provides excellent cross-country skiing and snowmobiling. The crater is approximately 5 miles wide (east to west) and nearly 4 miles long (north-south). The crater’s rims are steep and rocky, ranging from 700 feet to 1,700 feet. The Newberry Volcano is approximately 30 miles long (north to south) and nearly 20 miles wide (east to west).